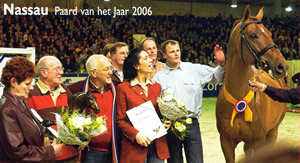 Nominated with nine other candidates including Lingh, Judgement-ISF and Jazz (see KWPN-NA website), the announcement was made February 4, 2006 on the final day of the KWPN Stallion Show in s’Hertogenbosch, Holland . Nassau is owned by Americans Dr. and Mrs. Marvin Hausman and Gebr.van Manen of the Netherlands. Nassau and his rider Jeroen Dubbledam, 2000 Olympic Gold Medalist, had a phenomenal year. 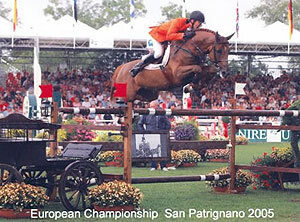 Among the highlights were being named to the Dutch Team, Gold at CSIO Barcelona, Silver at the Dutch National Championships, and Double Bronze at the European Championships. The KWPN Horse of the Year selection was made by a jury including the popular vote from around the world and a trophy was presented to the breeder Mr. and Mrs. Roel Hagedoorn. A replica of the trophy was presented to the owners. The Hausmans, who have traveled to the Stallion Show for the past 9 years, were on hand to receive this prestigious award and take part in the award ceremony.